Last month this blog post on the New York Times website made the rounds of my Twitter stream. Apparently evidence is growing that too much sitting can be harmful to our health, even for those who exercise regularly. I’ve been reading about the benefits of standing desks for a while now, and this was the push I needed to give it a try. Plus, that fat cat was really scary. In some ways the work setup is even better than the pile of books at home, because the keyboard is close to the edge of the journal holders which encourages me not to drop my wrists as I type. Both setups are easy to put up and take down quickly, which is important because one thing I’ve learned over the past couple of weeks is that I’m not ready to move to a standing desk full time. 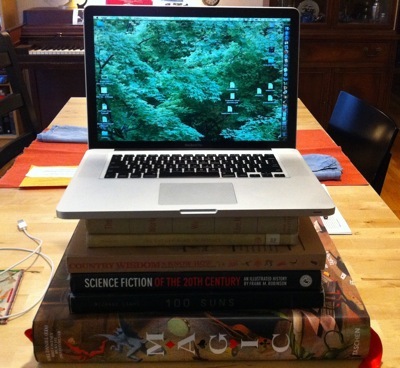 Certain things are more difficult to do while standing, like eating while working or writing in longhand (though the latter would likely be easier on a real rather than temp standing desk). But I’ve found that I really enjoy having the option to stand or sit while I work. 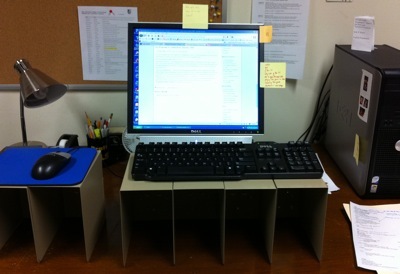 Standing seems to make it easier for me to focus on certain tasks, like sustained work on a project. On the other hand, if I’ve been running around between meetings and teaching and other stuff, it’s nice to sit down for a spell. For the past 3 years librarians in many different libraries and countries around the world have collaborated on the Library Day in the Life project. Library workers blog, tweet, or post photos or videos to shine a light on what it is that we do all day. So far I’ve never participated — the project takes place in January and July, at times that aren’t during the regular CUNY semesters. I’ve always felt a little odd about joining in because I don’t really consider the days this week to be typical for me. But I’ve been quiet on this blog lately, so I thought this might be a good year to jump in. My plan was to chronicle yesterday, but then we got 15″ (or was it 18?) of snow and the college closed (I took my kid to the park instead). So I’m going to try and reconstruct Wednesday’s work happenings. On Wednesday I got into work at about 9:15, a little late for me (I had a routine doctor’s appt). Usually I try to get to the library by 8-8:30 and spend the time before I officially clock in working on research + writing. I’m most focused in the morning and I find that I’m most productive (especially with difficult tasks like writing) if I stick to this habit. Doesn’t always work out, but I’d say I keep to the plan more often than not. Once my day officially started I triaged (answered, filed, deleted) email for about an hour. I also posted my handout on our staff wiki from the morning not-really-a-retreat we had in department the prior day. The theme of the non-retreat was productivity and connectivity, and we spent lots of time discussing email management techniques and how to use our new staff wiki for information we all need to access. I tried to use some of these email techniques this morning — while I’m not an inbox zero person I do try to keep my inbox relatively clear. I was bad about clearing out my sent mail folder last semester so I’m making a special effort to keep that manageable now. Then I ran some errands around campus. First I went to media services to drop off a request for a media cart for our Web 2.0 Happy Hour faculty wine & cheese program in March. Next I took the handout and worksheet to the campus copy center to be copied for our English Composition I library instruction sessions, a required component of that course. Finally I headed to the grants office to pick up and drop off forms, and checked in to confirm that a grant I’m submitting is complete. I don’t remember exactly when I had lunch, but it’s usually no later than noon. Most often I bring my lunch and eat at my desk (boring, I know). Probably did a quick email check and looked at my Google Reader briefly, too. Next I spent some time crunching data from the surveys we ask students in our English Comp I sessions to fill out. Since we’ll be giving the survey to students during the Spring semester I didn’t spend too much time running the numbers now, but I like to take a look before the new semester begins to see if there are any unusual comments. This time a student requested additional materials for help with using the library from home, which dovetails nicely with our plans to create more online video tutorials and guidelines. I also checked in on our faculty feedback form responses from last semester’s English Comp I sessions. Frustration in dealing with plagiarism was mentioned a couple of times. Unfortunately we don’t have time to discuss plagiarism thoroughly in our sessions (they’re only 75 minutes), so I emailed the instruction library faculty to pick our collective brains about strategies for helping to address the plagiarism issue. After that I played around a bit with Zotero in advance of a faculty workshop I planned to co-teach this morning (but instead I was home with a sick kid — too much sledding?). I’m a bit sheepish that I haven’t used Zotero much in the past, and I’ve liked having an excuse to become familiar with it. I’m particularly excited about the collaborative features, which I think will come in handy for several projects I’m working on right now. Next I made some coffee and prepped materials for our department curriculum committee to use to crossgrade student assignments as part of the collegewide assessment committee work I’m involved in. I’m on a few college and university committees and I genuinely enjoy most of my service work. It’s been a nice way to learn more about how things work and helps keep me thinking about how the library fits in with the broader institutional mission. After putting in a request to CIS for student email addresses for a pilot program we’re trying this semester, it was back to email. I’ve been making the effort to keep my email to discrete chunks rather than checking constantly all day (I turned off notifications), but sometimes it’s difficult. I headed out for home shortly after 5 today, when the library closed. During the semester we’re open later and I tend to stay a bit later, too. I try not to do too much work at home in the evenings, but I had a couple of time-sensitive things to get done this week. One of the students in my class last semester asked me for a recommendation so I wrote that up for her. I also did some formatting tweaking on the preliminary report of last year’s fieldwork that my research partner and I recently finished writing. And that’s about it for this day. Next week this will all change, but I love the busy beginning of the semester after the (relative) quiet of January. This year my research partner and I are expanding our qualitative study of student scholarly habits, so this semester I’m taking one RT day a week for fieldwork. We spent some time over the summer working on a preliminary analysis of last year’s data, and it’s great to get back to collecting data and interviewing students again. Though my field days can be long and tiring it’s completely fascinating to learn about students’ lives at school and beyond. Last year I collected data at my own college (City Tech), but this year I’m working at another CUNY school: City College. I expected that the surroundings and students would be different — many of our programs at City Tech are unique in CUNY, and CCNY has grad students, while we don’t at City Tech. But I hadn’t anticipated the many other ways that fieldwork would be different this year. In a sense I’m like a new student. I don’t know where anything is, though posting fliers to recruit students helped me start to internalize the layout of the college. CCNY has a much bigger campus than City Tech, so at the beginning of the semester I constantly underestimated the amount of time I needed to get from one place to another. Sometimes the cafeteria is so crowded that it’s hard to find a spot to eat lunch. I can’t ever seem to find an outlet to charge my phone and netbook when I need it. And until I scored a guest wifi password last week I was (guiltily) jockeying with students to use computers in the library (I have trouble typing lengthy emails on my phone). Like many CUNY students, my commute is long: 1+ hrs each way, whether I come from home or from work. I need to carry what sometimes seems like a ridiculous amount of stuff: reading material for the commute, notebook, consent forms and instructions for students, disposable cameras (sometimes), voice recorder, netbook, stapler, tape, lunch, water, jacket (and–perish the thought–sometimes it rains, so add an umbrella to the list). A colleague in the library has graciously offered to let me stash my outerwear at her desk when I’m up at City, but it’s so different from last year, when I could meet students at my own desk. As I’ve interviewed students I’ve found that I’m learning a lot from them that’s not only great project data but also immediately useful to me. Where are the best bathrooms in the NAC Building? What’s the quietest spot in the Cohen Library, esp. during the very crowded afternoon hours? What’s the best food in the cafeteria? Where are the working electrical outlets? It’s interesting to consider my own experiences as project data. I’ve kept a research journal since last year so I can keep track of how things are going in the study. Last year it mostly included personal thoughts and notes about best practices for data collection method, but this year my journal could be an additional data source, too. I’d wager that these three databases together probably capture the lion’s share of our undergraduates’ searches — if not in total then at least their first attempts at finding information on their research topics. I haven’t had time to fully explore the changes, though I did take a brief spin through each database. 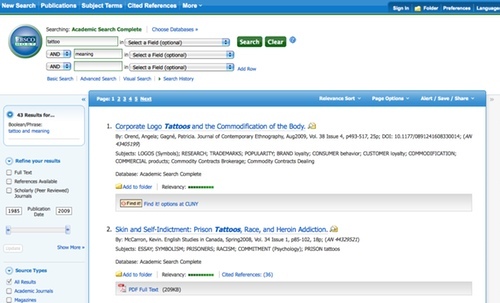 At first glance the EBSCO changes look fairly minor. In their last redesign they added an incredibly useful feature — a pop-up bubble that displays an article’s abstract from the results list — so I’m predisposed to feel positive about this redesign. On the results list, all of the options that can be used to refine results have been moved to the left side of the page (previously they were split between left and right columns). I’d guess this will make it much easier for students to use these options. Another nice new feature is that once you click through to the article detail page, the links to use to print, save, email, etc. the article appear in the right column under the Tools menu. Of course these are only a few of the changes, but I’d like to point out just one more that I like: in the top navigation bar the Thesaurus link now reads Subject Terms. The less time librarians have to spend explaining library jargon, the better (IMHO). I’ve always disliked the LexisNexis interface so my hopes were not high for this redesign. 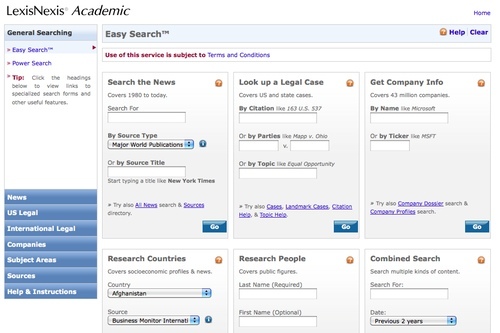 So I was pleased to see that the changes have made LexisNexis much easier to use. While the Easy Search page looks a bit busy, most students will probably get the most use out of the Search the News box. And the news search from this page is much, much better than it used to be. It’s streamlined, and with far fewer choices it is far less confusing. An advanced search with more fields and limiters is just one click away on the All News page. Most importantly, the News search now defaults to all available dates. Previously the default date range was only the prior two months, and the dropdown menu to change this option was all the way at the bottom of the page and very easy to miss. I’m still not a big fan of the LexisNexis results or article displays (why are the icon links for printing/saving/emailing so incredibly tiny? ), but the search redesign is definitely a step in the right direction. And then there’s JSTOR. 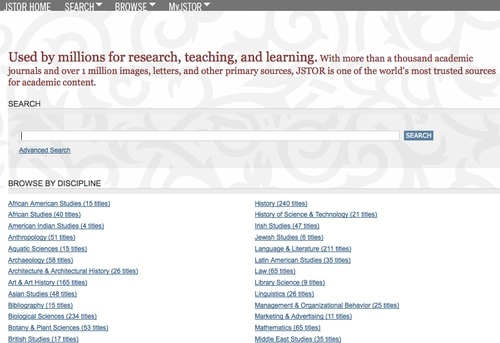 JSTOR caused quite a stir late last month when their interface changes were unveiled. 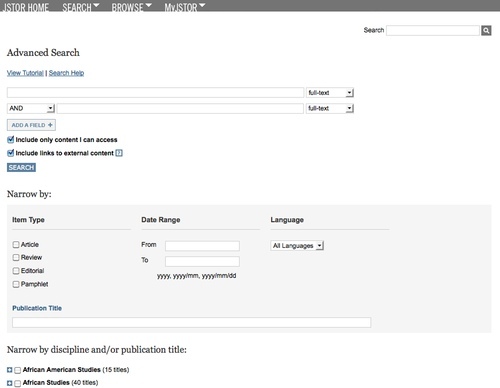 Briefly: when the redesign launched, the search results defaulted to displaying articles from all publications archived by JSTOR. While this doesn’t sound like a problem in theory, in practice not all libraries subscribe to all JSTOR collections. The kicker is that initially JSTOR didn’t enable OpenURL, which allows libraries to link between databases. This meant that search results were potentially returning lots of articles that could be available in another database, except there was no way to link over to them. Lots of librarians cried foul when they realized the scope of these changes, and you may have seen the article at Inside Higher Ed and several blog posts (here and here, to name just two) about the kerfluffle. And luckily JSTOR responded pretty quickly, so OpenURL has been enabled. Other than the linking issues, I think the JSTOR interface changes are great. Again, I’d never been fond of their previous interface – I found it deceptively simple with just the one field for search terms, and the Advanced Search always seemed overly confusing. 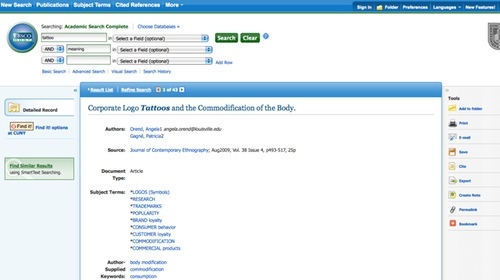 The new interface still has just one field, but with the addition of Browse By Discipline links that make it easier to drill down to a specific journal or quickly scan the journals available in each subject. The Advanced Search also seems streamlined and easier to use. Again there’s the option to limit by discipline or individual journal, which seems like it will be really useful for beginning students who may get far too many results if they search across all disciplines. These redesigns will definitely change the way I teach students how to use EBSCO databases, LexisNexis and JSTOR. At City Tech our research and library instruction program starts up again tomorrow, and I’ll be interested to see how students react to the changes, too. A few weeks ago I was disappointed to have to miss the CUNY Games Network‘s final meeting of the year. Sounds like Frank Crocco’s Gaming Your Syllabus workshop and Andrew Boyarsky’s demo of his game Who Wants to Save the Planet were both fun and useful. I wasn’t completely ignoring games on June 4th, though. I spent the day at the annual program of the Association of College and Research Libraries (ACRL) New England Library Instruction Group (NELIG) up in Connecticut. The NELIG conference was devoted specifically to library instruction and information literacy, and I heard lots of great presentations (I wrote up some of the highlights here). Keynoter John Palfrey (Vice Dean for Library and Information Resources at Harvard Law School and co-author of Born Digital) shared a very interesting piece of game-related info: their research revealed that gaming is one thread that connects and joins teens across socioeconomic statuses. But the main reason I headed up to the conference is that I was a presenter. I spoke about a low-tech classroom game I’ve been developing and implementing over the past semester called Quality Counts, which is designed to help students learn how to evaluate internet sources. I was tickled to learn afterward that my talk was liveblogged (and my slides are available here). Of course the inspiration for this game came from a CUNY Games Network meeting, and it was great to have the chance to discuss the group as well as my game. After my presentation I chatted with several folks who wanted to learn more about us (and who seemed a bit envious, to be honest!). One of the things I find most inspiring about Games Network meetings is the opportunity to connect with other faculty and staff across the university to discuss using games in teaching and learning. I never fail to come away from our meetings with fresh ideas for my own teaching. So while I was sad to miss the meeting, I was pleased to have the opportunity to speak about my game and about the CUNY Games Network. And I’m looking forward to getting back to our meetings again in the fall. By now everyone’s probably heard about the storm a’brewing in scholarly publishing this week. I don’t want to repeat what’s been very ably said in many other spaces on the internets, but as an open access advocate I couldn’t let the week end without at least collecting together some of the high points of the discussion. In brief, the University of California system libraries are resisting outrageous price increases for the Nature Publishing Group’s scholarly journals. This situation is, sadly, a familiar one for academic librarians, and this is not the first time that a large consortial group has pushed back. What’s new is the scope of the resistance: unless NPG comes down in price, U Cal faculty are being asked (among other things) to decline to peer review or submit articles to NPG journals. This is huge, and a huge step in the right direction. As a librarian, a faculty member and a researcher I am absolutely thrilled to see this happening, and I’ll be following the situation closely as it evolves. The Chronicle of Higher Ed‘s article U. of California Tries Just Saying No to Rising Journal Costs provides a thorough introduction to the boycott. Bethany Nowviskie, Director of Digital Research & Scholarship at the University of Virginia Library, wrote a great post called Fight Club Soap that, among other things, includes a powerful discussion of the relationship between scholarly journal pricing and scholarly monograph publication. Good stuff, all. Go read it! The information landscape has changed dramatically in the past two decades. It sounds hackneyed and idealistic, but the ability to research and use information in a critical, well-considered way is a life skill that’s increasingly valuable. Our students need to be able to deal with these changes and navigate information resources, even (especially!) those students who aren’t going on to graduate school. Information literacy is the term used by librarians and others in higher ed to describe these competencies. We teach information literacy to students in many different settings: at the Reference Desk, in one-on-one appointments, via online tutorials and guides, and in “one-shot” library workshops, to name just a few. While there is evidence that these instructional strategies are useful for students, many librarians feel frustrated that our interactions don’t afford us enough time to address much more than the most basic information skills. Where does information come from, how is it produced, and by whom? Why are some information sources privileged and respected while others are not? How can we negotiate complex information issues like access, preservation, privacy, and ethical use? How is information organized (and who does the organizing)? How can we develop strategies for searching and finding relevant information? Why do we evaluate the quality of information? Should we? What are the reasons for documentation and dissemination of information? What role does information play in our lives, in college and beyond? What is the future of information? This is not a library skills class. We do not spend 15 weeks teaching undergraduates how to act like librarians. Yes, we teach students how to use the online library catalog and databases, but that’s far from our primary goal. In these courses we have the time to encourage thoughtful engagement by students with a wide variety of information and media, as both content producers and consumers. – Contrasted publishing in traditional print media like newspapers, magazines, books and scholarly journals, with digital publishing in all forms, from text to audiovisual media. – Examined and experimented with the opportunities and challenges of participatory media through our interactions both in class and on our course blog, which was openly available on the internet. – Used our discussion of complex information issues to shape each student’s development of a topic to explore in depth via a research proposal, annotated bibliography, and research paper. – Investigated the mechanics of information organization in print and digital media, both human-generated and machine-based systems, and experimented with tagging as a classification tool for our course content. – Applied our knowledge of classification systems to create strategies for searching various information sources successfully. One student remarked that she knew she’d found the most appropriate keywords to use to search for information when she discovered an article on nearly her exact research topic. – Obtained information on students’ research topics from scholarly, journalistic, and general internet sources, analyzed this information, and presented the results in a research paper. – Collaborated in pairs to synthesize the results of each student’s research topic, and used an online publishing tool to share the findings. Students chose wikis and blogs for this project and used these spaces in ways that exceeded the requirements of the assignment, for example, to communicate with each other and share notes and resources while the project was in progress. – Analyzed and documented the process of working on the collaborative project, and presented both the project and documentation to the rest of the class for discussion. The library doesn’t hold a monopoly on information literacy, of course. Similar work to what’s covered in this course happens in other courses and other departments as well. But information literacy competencies must develop and strengthen over time, and a course can provide our students with a solid foundation on which to build. An information literacy course can help our students hack the new information landscape and prepare for the future. Lately I’ve been thinking about how students, faculty, and librarians use academic libraries. It all started last month after the latest Ithaka Faculty Survey results were released. Many survey responses seem to indicate that faculty use of academic libraries is decreasing. Of course there was much discussion of the report all over the higher ed (the Chronicle and IHE) and library (ACRLog and Library Journal) bloglands. I read these articles with interest but not surprise. In my past life when I was in graduate school for archaeology I was a heavy library user, but it was while working with my advisor that I learned about the major scholars in my field of specialty. I mined the bibliographies of the articles and books assigned for my courses, searched the library catalog for books, and browsed the stacks in the call number ranges for the subjects I researched. I belonged to the scholarly societies for archaeology and anthropology (and got their journals), and sometimes I browsed the table of contents in other relevant journals in the library’s current periodicals section. To be honest, I don’t think I ever consulted with a librarian at my university’s library the entire time I was in graduate school. I suspect that my process from many years ago is not all that different from the ways faculty and graduate students do informational research today. It’s so much easier to use online indexes that I’m sure researchers search their specialized databases, but they do so with preexisting knowledge of their field, both the vocabulary of their subject matter and the major players in their discipline. However, as others have noted (e.g., William Badke’s comment on IHE), students approach information-based research for their coursework very differently. They don’t usually have deep knowledge of the disciplines and topics that they’re researching, and they don’t know the prominent scholars or publications. Many students, especially freshmen, are also unfamiliar with library databases and even physical libraries. Since the faculty research process doesn’t necessarily include librarians, that’s likely one reason why faculty see the library more as an information storehouse and less as a location for academic consultation. But our students really do need help to learn to make sense of the information landscape and do research successfully. It can be difficult for experienced researchers–both faculty and librarians–to put ourselves back into the novice researcher mindset of our students. Information literacy instruction can help students learn to do information-based research for their courses and to begin to evolve into more advanced researchers. Of course, there’s a huge variety of academic institutions, and variety in their libraries as well. I’m at a college library and coordinate our instruction and information literacy program, so working with students is always on my mind. But there’s also some good news out there as a counterpoint to the Ithaka study. Barbara Fister just published the results of her survey of academic administrators and found that they all value the library for a wide variety of reasons. And while many mentioned that academic libraries will continue to change and evolve in the future, none envisioned them disappearing. For a while now I’ve been thinking on a post about using WordPress for the course I’m teaching this semester, but have been too busy to get to it. Then this past week saw a post along the same lines from David Parry over at Prof Hacker, with extensive comments by CUNY’s own Joe Ugoretz, who has blogged about using WordPress in his online course this semester right here on the Commons. What could I possibly have to add to these great, detailed posts and comments? Well, I’m here to give a plug for the humble old freely-hosted course site/blog on WordPress.com. My course is fully face-to-face, so I don’t need many of the customizations that others use for their courses. And while I do admit to a bit of envy re: integrating gradebook functionality, especially, I’ve been pleasantly surprised at how well my course site has worked this semester. Importantly, it took a minimum of time and tech skills to set up, and is easy and fast to maintain. While it’s true that I had used WordPress before this semester, none of my students had, and they were expert bloggers after the very first class. Why use the free version of WordPress? For me it mostly came down to economics: I didn’t want to shell out to buy a new domain. (I have a personal website and server space, but didn’t want to host something work-related on that domain.) I also didn’t want to spend the time on a custom WP install during the intersession. This is my first semester teaching a credit-bearing course in a while, and I had lots to do to prep the course in January. 1. Syllabus: I made a traditional paper version of the syllabus to hand out on the first day, with the usual course requirements, policies, schedule, readings, etc. Everything from the syllabus except the readings is on this page. Bonus functionality: when the schedule has, inevitably, had to change a bit, I’ve been able to post updates. 2. Blogging Guidelines and 3. Assignments: Since their blog posts and comments are a fairly substantial part of their grade for the course (20%), I wanted to give my students detailed guidelines and a grading rubric. And while a brief description of all course assignments is on the syllabus, as the due date for each approaches I’ve posted more detailed information about each assignment, too. 4. Readings: This page lists all of the readings for the course. I am using a short textbook, but most of the readings are either freely available on the internet or accessible to students in our library’s subscription databases. Using the permalink feature in the databases I’m able to link to those articles directly from this page. I’m so pleased to be able to link to almost everything we’re reading this semester right from the course site (as opposed to the hours I spent in college waiting in line to buy coursepacks at the local copyshop). This setup has worked swimmingly so far. I might change things around some next semester — maybe a dedicated announcements page would be handy? I’ve been adding links to websites we discuss in class to my delicious (tagged “lib1201”), which I’ve linked on the sidebar as “Additional Resources,” and maybe I could pipe the RSS feed for those links right into the site at some point. But for now I’m happy with my course site. And while I’m still using a plain old spreadsheet for their grades, I’ve subscribed to the course blog posts and comments in my feedreader, so I always know when my students submit their blogging homework. This semester I’m teaching the first credit-bearing class in our library department: Research & Documentation for the Information Age. It’s been fantastic — while it’s a small class, the students are dedicated and we’ve had some great discussions so far about how information is produced and distributed. One of the best things about teaching a semester length course (as opposed to single class sessions) is the luxurious amount of time we have to explore the landscape of information. I have the space to devote an entire class to traditional print media, another to digital text, another to non-text media, etc. I’ve also been able to do something I always want to do in the one-shots: bring in different examples of print media for discussion. Over the past two weeks I’ve brought an academic journal, newspaper, popular magazine, trade journal, and three zines on different subjects (music, parenting and librarianship) to class. I’ve long felt that it’s confusing to undergraduates when they’re confronted with article databases in which everything looks the same. Even on the internet, it can be hard to read visual clues other than advertising (which can sometimes be very subtle, too). The differences between the content in different types of publications are much more obvious when you can hold and flip through them. It was also amazing to learn how much my students appreciate the physical embodiment of these different media. Most of the students in my class are of traditional college age, the so-called “millennial” generation. While I don’t necessarily buy a lot of the digital natives hype (based on my own experiences as well as others’), the truth is that all of us, me included, are probably heavier users of digital media these days. One student lamented that he missed browsing in music stores for CDs, and other revealed that he didn’t like buying MP3s because there wasn’t anything physical with the purchase. Next week we start talking about some big meaty information issues: ethics, privacy, access and preservation. I can’t wait to see what insights the students bring to those discussions.